If you're like me - then you like flowers. A lot. I seriously have a small obsession with having fresh blooms in the house. So much so, that I have them delivered from the flower market in Reno. If I don't have fresh flowers in the house, I don't feel like the house is alive. At the very least, I have live plants potted throughout the rooms, because I once read it in a Feng Shui magazine when I was 14. It stuck. One of my favorite flowers is a hydrangea. They're easy to grow pretty much everywhere (side note - I've never seen anything as beautiful as the hydrangeas I saw in France), and they're fairly inexpensive. Plus, they make a BIG impact in arrangements. The worst part of hydrangeas though? Their finicky temperament (insert angry red emoji face). For years I would talk to my hydrangeas as I drove them home (buckled in) in the front seat of my car. I would beg them not to be wilty for at least a week, and sometimes they'd listen, but often times they wouldn't! It would make me so sad to walk out to the kitchen only to see an arrangement with a completely droopy hydrangea. To help prevent wilting in the first place, keep your stems in a cool place until you're ready to arrange. Even on the drive home, make sure they stay cool (this means wearing a jacket and blasting the air conditioning if you have to...). Also, make sure they don't spend even a second without cool water. 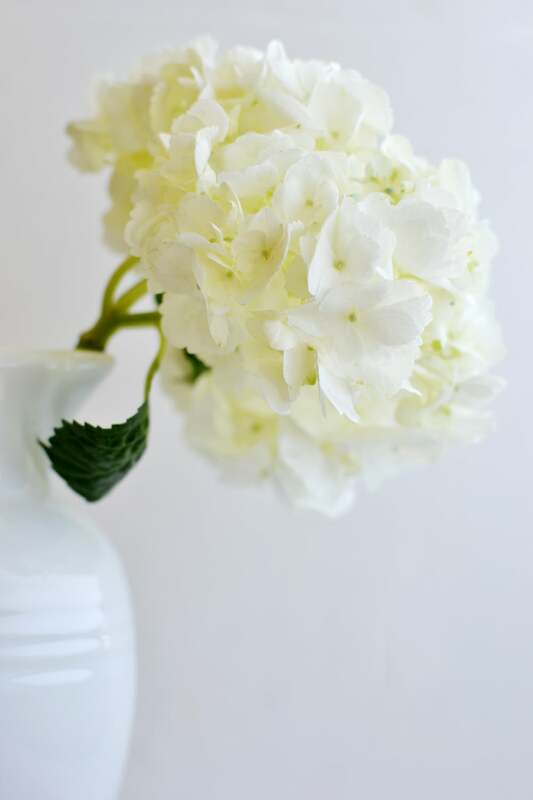 One of the FIRST blog posts I ever wrote happens to be on hydrangeas, and in it, I mention lots of tips for caring for the outdoor plants, and a few tips for caring for cut plants, but this is the best piece of hydrangea advice ever. I have to say, I haven't tried this technique for home grown cuts yet, but it works like a charm for store bought! What is this technique you might ask? Yep, that's it! Simply place the entire stem in a bucket of cold water, and watch as she perks back up! It takes a few hours for the transformation to happen, but it's absolutely amazing! It makes sense, though, because Hydrangeas hate hot climates and they love lots of water.